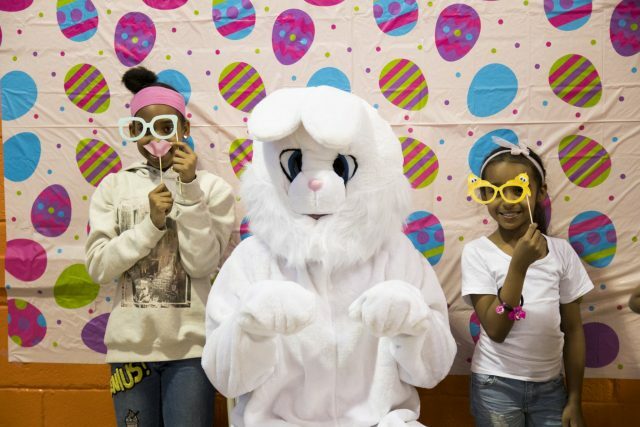 Children enjoyed spending time with the Easter Bunny at a HeartShare St. Vincent’s Services holiday dinner on Wednesday, April 5 at Wyckoff Gardens Community Center. 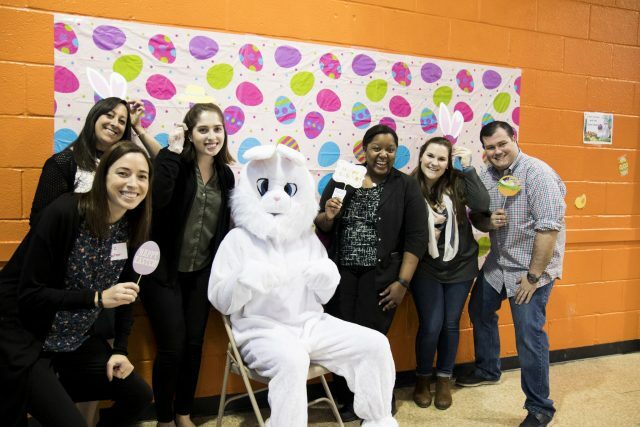 (Brooklyn, NY)— HeartShare St. Vincent’s Services (HSVS) hosted an Easter Dinner for its children and youth on Wednesday, April 5 at Wyckoff Gardens Community Center in Boerum Hill. “For many of our children and youth, this dinner is their only opportunity to celebrate the holiday. We are grateful for the energy, leadership and generosity of our Junior Board, which organized and hosted the event,” said Brooke Rosenthal, HSVS Vice President of Community Programs. The HSVS Junior Board is a group of young professionals, who volunteer their time to strengthen the agency’s programming and development efforts. The Junior Board often engages directly with children and youth at events, such as at the Easter Dinner or during holiday parties. During the past year, the Junior Board also hosted several fundraisers, including happy hours, a salsa night, and an ugly sweater party to raise dollars for HSVS children and families. Councilman Stephen Levin led the ceremonial opening of the Wyckoff afterschool and summer program site last Fall. HSVS has four other Community Programs in Brooklyn, including the McKinley I.S. 259 Beacon Program and P.S. 102 One World COMPASS Program in Bay Ridge, as well as the P.S. 288 Shirley Tanyhill Beacon Program and Surfside Gardens Cornerstone Program in Coney Island. If members of the community are interested in volunteering at the youth program, please contact brooke.rosenthal@heartshare.org. If young professionals are interested in joining the Junior Board helping kids and youth in foster care, please contact lauren.pettiette@heartshare.org. The HeartShare St. Vincent’s Services Junior Board is a group of young professionals who support the agency’s programmatic and fundraising efforts.